We're on an eight-day motorcycling tour of north-eastern Vietnam, riding Honda XR250 trail bikes across the valleys and over the mountain passes of Ha Giang province and through the wild, remote and rarely visited mountainous "frontier lands" along the Chinese border, where roads are narrow, winding and steep, and the scenery is truly breathtaking. 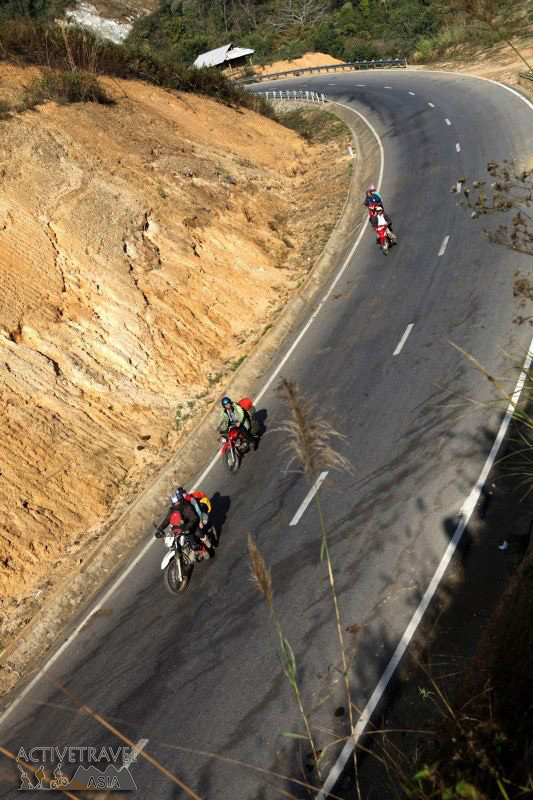 ROADS TO HAPPINESS: One of the group's motorcyclists in the mountainous Ha Giang province. It's a ride-it-yourself adventure, but we have two guides, Linh and Thon, who know where they are going, which is just as well, because we're having enough trouble just negotiating the traffic. Many of these "small ways and snake roads" - so called because of their sinuous shape rather than any abundance of serpents - aren't on the tourist maps and are definitely off the tourist trail. Linh and Thon also know how to carry out roadside repairs, skills that prove useful more than once. There are 12 of us in our group - nine experienced riders and three pillion passengers. We've known each other for years and most of us have travelled together before on various motorcycling road trips. But as we gather on the second-storey terrace of a Hanoi bar the day before we set off, our nonchalance starts to dissipate while studying the chaotic traffic that swirls below us, trying to determine whether there is any method in the madness (there's not! ), counting crashes and watching first-time visitors to Hanoi with fear at the prospect of crossing the road. It's a bit of a blur, but somehow we manage to get out of Hanoi in one piece, and it's not long before we find ourselves riding along back roads beside rice paddies and meandering rivers, sharing the road with tractors, buffalo, dogs, chickens and ox-drawn carts, along with the stream of bicycles and motorbikes. As we ride through the villages and towns, we're treated like rock stars, kids and adults alike grinning, waving and calling out hello. At first we think it's because they don't get many visitors in these parts, which is true, but then we realise it's because we're riding bikes that are monsters compared with the tiny 50cc-150cc bikes and scooters they ride, and even the petrol station attendants can't resist climbing on our bikes to pose for photos whenever we stop to fill up. It may also be because we are somewhat overdressed - in Kevlar-reinforced jeans, protective riding jackets, leather boots, gloves and full-face helmets - compared with the locals in their sandals, short sleeves and nifty little hard hats with special holes at the back for ponytails - but I have no desire to experience a Vietnamese road-base exfoliation. Miraculously, in eight days and 1200 kilometres of rough riding, our group of 12 experiences only three tumbles, and none results in any injuries. We ride between 160 kilometres and 180 kilometres each day, which doesn't sound much - at home we ride that far just for fun on a Sunday morning - but at an average speed of about 40kmh, often less, it takes all day. By our third day, we've relaxed into the rhythm of the roads, have more or less got our heads around the organic nature of the traffic flow, and are high on the exhilaration (and adrenalin) of riding some of the world's best (and most challenging) motorcycling roads up and over countless mountain passes, the summits shrouded in mist, the deep-sided river valleys terraced with rice paddies, the distance filled with sawtooth ranges receding as far as the eye can see. 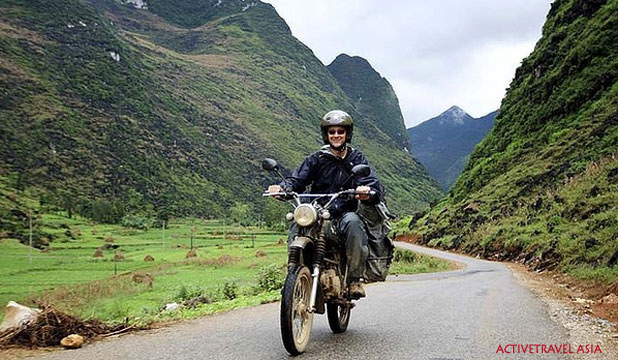 One road in particular has us spellbound, the aptly named Road to Happiness from Ha Giang to Meo Vac via Dong Van, which includes the famous Ma Pi Leng Pass, a stretch so precipitous that workers had to be tethered to the cliffsides during its construction in the early 1960s. We eat lunch in cafes, throwing our scraps on the floor, along with everyone else's, and stop at roadside stalls for sweet milky coffee and fruit dipped in chilli and salt. When our seats become too hard or the view too beautiful to ignore, we pull over for a rest, which often ends up attracting a crowd, thanks to the wannabe magician in the group - he only knows one trick but it never fails to delight the local kids. We stretch our legs at village markets, where we rub shoulders with men in indigo suits and women in colourful embroidered costumes who have travelled in from remote mountain villages, usually on foot with heavy loads strapped to their backs, along the same steep roads we are riding. We spend our nights throwing back shots of lethal local rice wine with our homestay hosts before bedding down on mattresses on the floor beneath mosquito nets in one large communal room built on stilts, infinitely more comfortable than the few local hotels we stay at with the rock-hard beds they favour in northern Vietnam. 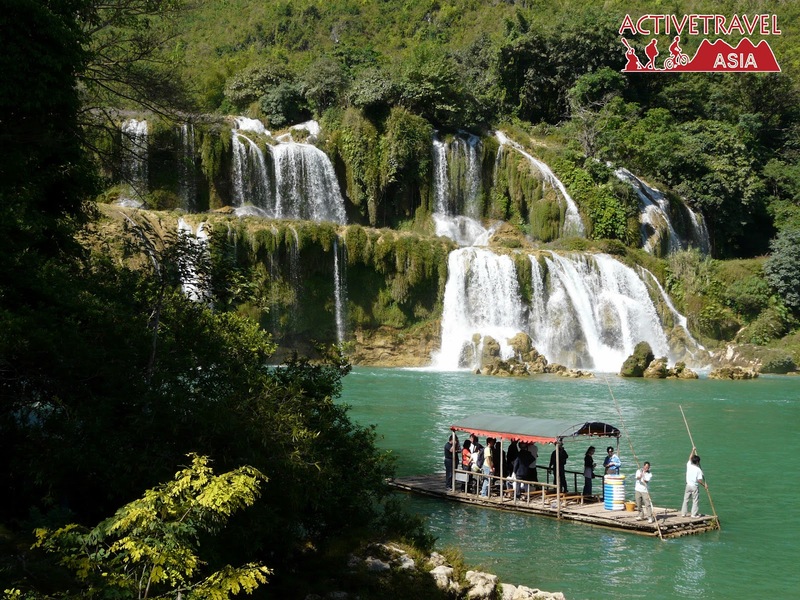 At Ban Gioc waterfall we take a short ride on a bamboo raft and get so close to China we can chat to Chinese tourists on the other side, but Vietnam and China aren't exactly best mates, so we're warned not to step ashore on Chinese territory. The next day we get caught in a never-ending line of trucks carrying cheap goods across the border on a dusty road still under construction, which in Vietnam is no impediment to travel. You just weave your way around the road crews and hope like hell a road exists on the other side. By the time we get back to Hanoi we're road weary and ready to stop - eight days and 1200 kilometres is a long time to spend perched on a wire rack, even with a tower of cushions on top - but if you want to see, smell, hear, touch and really experience Vietnam, mixing it with the locals from behind the handlebars of a motorbike is about as full on as you can get. Riding a motorcycle in Vietnam is a high-risk activity. Check that your travel insurance covers motorcycling and be aware that as a foreigner you will be expected to pay compensation (in cash and probably on the spot) in the event of an accident, even if you are not at fault. It is not possible to get a temporary Vietnamese driving licence on a tourist visa, but an international driving permit (available from the NRMA) is usually accepted by police — although, officially, no foreign licence is valid in Vietnam, and harsh penalties (determined by the police) can apply for riding or driving without a licence. The mountainous area of Northern Vietnam has long been famous for its beautiful scenery and great diversity of ethnic minorities. With our adventure motorcycling trip you will make a big loop to experience all the bests that area can offer. 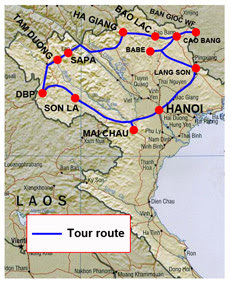 Starting in Hanoi you will explore Northwest before jumping into Northeast, back to Hanoi after a day relaxing in Ba Be Lake. The perfect itinerary and the support crew ensure you get the most out of the trip in terms of comfort, enjoyment and adventure. Along the way we encounter dramatic landscapes and sweeping panoramas as the rural population goes about its business. Highlights include the terraced valleys of Sapa, beautiful Ban Gioc Waterfall and many different colorful minority groups.